These agitator tilting kettles are entirely made of high quality stainless steel and are suitable for cooking food such as meat and potatoes, as well as soups, sauces and ready-made meals. The RKK – EG is an electrically heated agitator tilting kettle with built-in steam generator. 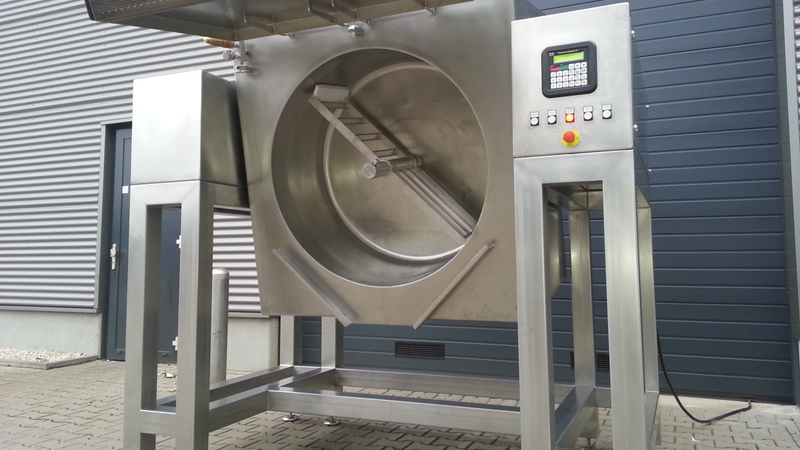 The agitator kettle works according to the principle whereby electrical heating elements generate steam, in order to evenly and most effectively heat the inner kettle.  prevention of temperature overshoot after reaching setpoint. Electrically heated, power is 19.8 kW. Bottum and side wall heated. Max. steampressure is 1,4 bar (126,3 °C). Inside dimensions: Ø900 x 500 mm. Outside dimensions: 2060 x 1200 x 1300 mm. Only premium high quality stainless steel. Mantle and inner kettle insulated. Cover (lid) opens and closes automatically. Agitator is easily removeable with a quick device change. Easy oparating microprocessor ADITEC MIC 821 control in waterproof stainless steel housing.